For many of you you have already purchased fifty or more dollars and chosen from the FREE Sale-A-Bration goodies. I really have enjoyed the matching paper and beautiful ribbons this year. We haven't had a pretty yellow ribbon until now. The ribbon bundle has certainly celery twill and so saffron grosgrain both are 5/8'' wide. With 10 yards of each the bundle is a great FREE item. 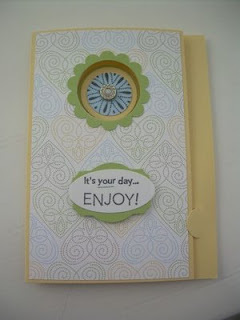 The tri-fold card shown above is using the FREE Delicate Dots Designer Series paper and the Polka Dot Punches stamp set. The tri-fold card will be made at a class in March.